The Outer Banks Seafood Festival Board of Directors is now accepting applications for the 2019 Grant Program. The Outer Banks Seafood Festival Grant Program was introduced in 2015 as a way to give back to the seafood community. Grants are awarded to eligible organizations whose mission and purpose align with the purposes of the festival. These grants will be handled as reimbursement grants and organizations receiving funds must provide proof of fund expenditures for the purpose stated in the grant application. The application window to apply for this Grant is open now and will remain open until April 19, 2019, 5:00 p.m. 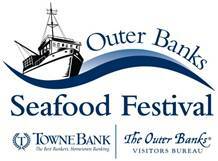 The application form and guidelines can be found at outerbanksseafoodfestival.org/grant or you may request an application by contacting Karen Brown at the Chamber at kbrown@outerbankschamber.com. Eligible organizations must be part of the Outer Banks community. Organizations applying for funds will need to include an explanation of the proposed use of the funds being requested and estimated costs associated with the proposed project. An explanation of how the grant funds fit into the overall project should also be included. Over 6,000 attended the 2018 Outer Banks Seafood Festival. The 2019 event will be held 10:30 a.m. to 6 p.m., Saturday, Oct. 19 at the Outer Banks Event Site in Nags Head. For more information, visit outerbanksseafoodfestival.org .